The How to Train Your Dragon franchise has heralded a great deal of critical acclaim over the past nine years. The movies are considered to be some of the most imaginative and well written of the DreamWorks lineage (with a third installment coming to theaters later this month.) 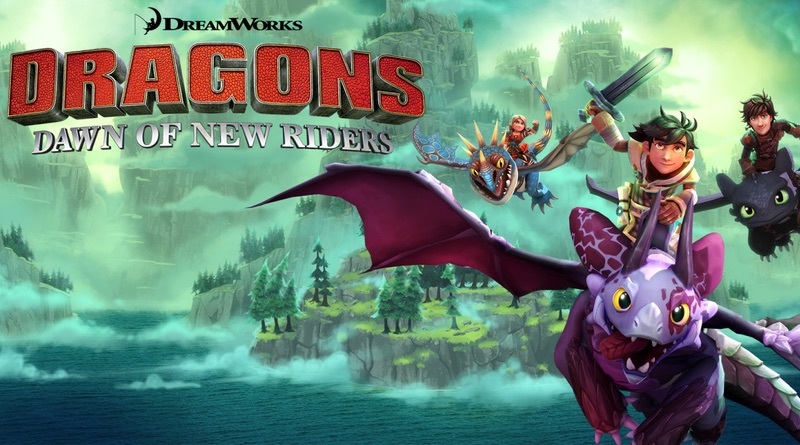 Along with theatrical praise, the ‘Dragons’ franchise has also seen success on smaller screens thanks to the Netflix exclusive television series “Riders of Berk.” Now, How to Train Your Dragon has its eyes set on another screen to conquer, and that’s the one on your Nintendo Switch, with Dragons Dawn of New Riders. This multi-platform adventure RPG comes to us from Climax Studios, best known for developing Assassin’s Creed Chronicles and Silent Hill: Shattered Memories. This is the studio’s first release for the Nintendo Switch, with Outright Games carrying the publishing duties. While this is releasing in promotion of How to Train Your Dragon: The Hidden World, this game features an entirely new story set in the Dragons universe. This particular story centers on Havenholme, an island dragon refuge off the coast of Berk that is attacked and burned down at the beginning of the campaign. You play as Scribbler, a native of the island who awakens after the ambush to find his memory wiped and a baby dragon named Patch at his feet. Along the way Scribbler joins up with Hiccup, Toothless, Astrid, and other characters fans will recognize from the series on his quest to rebuild Havenholme and (because this an RPG after all) recover his lost memories. From here, you’re free to explore the island, gather materials, unlock hidden chests, and beat up any bad guys you meet. The Legend of Zelda influences are definitely noticeable, especially once you transition off the island and are dropped into a series of dungeon levels. Besides the Norse aesthetic dressing up most of the scenery, what makes this title stand out are its flying segments and the unique gameplay of switching between Scribbler and Patch. Scribbler forges a suite of combat weapons throughout the campaign, which, combined with his inventory of potions and buffs, make him the ideal character to play as during the real-time battle sequences. Patch, on the other hand, has a variety of elemental powers that can be used to reach new areas in the map. This combined with his better resistance to NPC attacks makes Patch the perfect character for world traveling. You’ll be frequently switching on the fly between the two protagonists and combining their unique abilities in order to solve puzzles and defeat the large assortment of bosses. Between the dungeon crawling segments, you take to the skies alongside other characters and their respective dragons for fun and beautifully animated flying sequences, which are very reminiscent of the Gummi Ship sequences from Kingdom Hearts. They offer a fantastic shakeup to the gameplay and are easily the standout moments of the story. Unfortunately, while the top-down RPG gameplay is solid as a rock, the majority of the game’s standout features remain sorely underdeveloped. The concept of fighting alongside Hiccup and the other riders as a brand new character is an appealing one, but they could have done so much more with it than what they actually did. No doubt fans of the series would have loved the opportunity to create a rider in their image. A character creator at the beginning at the game would have been fantastic to see. Even something basic like the ability to play as different genders or people of color would have gone a long way in the overall immersion of the game. With the exception of a few armor pieces you can pick up along the way, what you see is what you get in terms of cosmetics, which wouldn’t be that big of a deal if Scribbler wasn’t inherently bland as a protagonist. Despite the majority of the gameplay revolving around switching between two characters to solve puzzles, there’s no co-op functionality to speak of. It’s so unusual to see what seems like an obvious feature to include nowhere to be found. The drop in and out style of co-op play popularized in the Lego games would have lent itself perfectly to this title, especially between the two Joy-Cons of the Nintendo Switch. There’s no voice acting to speak of and the unique charm of each character is inevitably lost on you having to take it all in through boxes and boxes of text. The game’s crafting mechanics and character progression also feel fairly watered down, and while the flying segments are rewarding, they don’t show up nearly enough to make up for the more shallow bits of gameplay. At the heart of these underdeveloped ideas is a solid game that fans of the franchise should still get a kick out of. I particularly had a lot of fun with the game in handheld mode. Exploring dungeons and fighting off Vikings in smaller chunks via handheld play made for a great time rather than longer play sessions with the Switch docked. This got me thinking that this title might have warranted better reception had it been developed for mobile devices rather than get a full release on consoles. Even at the $40 budget price, it’s still hard to recommend this title given its overall lack of depth. If you are going to give this game a spin for yourself, definitely opt for the Nintendo Switch version since you are able to play it on the go. Younger kids should get a kick out of this one, but it’s lacking some features veteran gamers have come to expect. Dragons Dawn of New Riders makes for an easy to pick up adventure/RPG and an entertaining romp through the Dragons universe. It’s not going to blow any minds, but fans of the series will love its charming presentation, while younger audiences will appreciate the game’s accessibility and light-hearted style.